When we visited Iwatayama Monkey Park in Kyoto last year, I spent a bit of time shooting several shots of the landscape with the plan to combine them into a Panoramic. Finally, here’s the result! It was a bit of an overcast day so i’ve had a bit of a play around trying to clear up the background and remove the seams between shots as best I can. 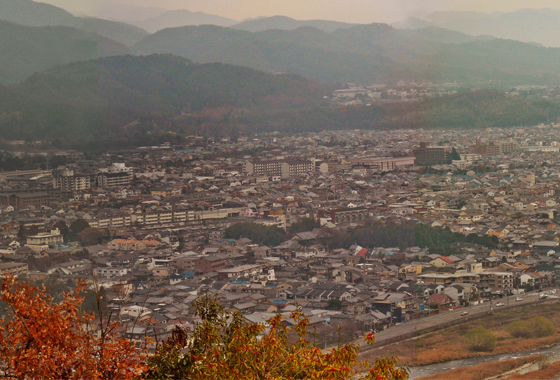 On our first trip in 2007 it was a nice clear day and Kyoto tower was easily visible but sadly not in this shot. I’m impressed by how much detail my little point-and-click caught, could stare at it all day and it also makes a prety great dual monitor desktop! Google map of the where I took the pics below. That looks amazing next time i go to Japan deffo want to see Kyoto!! It’s an amazing city, my favourite in Japan! Kansai is a great area to visit because there are so many cities all quite close together, Kyoto, Osaka, Nara, Kobe!